The 1612 Pro Engraver is ideal for light- to heavy-duty applications in a medium-size engraving area. Offering a 16" x 12" aluminum T-slot table, this wood, plastic and metal engraving machine has set the precedent for quality in the industry and is designed for professional and industrial marking applications. Applications: Trophies, plaques, gift items, notary seals, tool & die work, tags, plates, deep metal cutting, ADA-compliant Braille signage, parts marking, plastic engraving, control panels and more! Maximum work area 16" x 12"
Heavy duty steel construction, painted to match the Vision tables. Now you're not just limited to engraving lengthwise on your pens, cigar holders, miniature baseball bats or other cylindrical items…with the PEN ROTARY ATTACHMENT, you can engrave around the entire circumference! Compatible with the Vision 1612, 1624, 2424, 2448, 2525 and 2550, it can hold items up to 1.25" in diameter and up to 7" in length. This fixture allows you to hold various small items such as nameplates. Dowel pin settings allow this item to work with most Vision fixtures for even more versatility. A. Split Collet - Used for holding cutters solidly while doing light milling, cutouts, & other heavy engraving. Collet spindles hold both long & short cutters. B. Solid Collet - Converts your collet spindle to a standard top load spindle for standard engraving or burnishing. 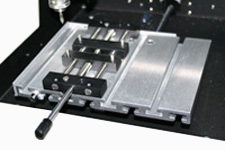 C.	Drawbar - For use with the collet spindle. Designed to assist in burnishing lacquered brass and anodized metals with just the right amount of pressure. Also used to mark glass. Available in 1/8”, 11/64”, 1/4”, 4mm and 6mm sizes. A. Large opening style is designed for engraving large letters. B. Small opening is designed for tight places and small letters. Available for all engraving machines. Belts are made of durable 1/8”urethane for long wear and better traction. Please specify machine type and total length of belt. 2 belt minimum purchase. Custom belts can be made to order if size is provided.